There have been some changes to the HF3 Wax Guard. The filters are still the same size. The only differences are the colors. 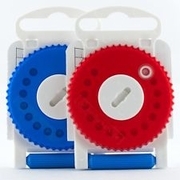 It no longer has a green wheel and the filters are blue and red. It is recommended that you change the wax filters every 3 to 6 months to keep your hearing aids in great condition.